NEW YORK – On Thursday, March 2nd, Japanese composer Misato Mochizuki was featured on Miller Theatre’s Composer Portraits series. In a concert featuring four U.S. premieres and concluding with a work commissioned and premiered at the 2015 Lincoln Center Festival, the audience was introduced to a range of her work. Throughout, Mochizuki demonstrated a clear aesthetic embodied by an interest in exploring a panorama of instrumental timbres and effects and a flair for dramatic, often quasi-ceremonial, designs. The earliest work on the program, Au Bleu Bois (1998) for solo oboe, was a standout. Mochizuki uses various playing techniques in an imaginatively constructed trajectory, ranging from microtones to multiphonics through all manner of alternate fingerings. James Austin Smith made this formidable work sound fluent and exquisitely well-shaped. Moebius-Ring (2003) was likewise given a persuasive rendition by Ning Yu, who handled its muscular, seemingly ceaseless, repetitions of corruscating glissandos with mastery. Percussionist Russell Greenberg’s committed and commanding performance of Quark-Intermezzi III featured a catalog of percussion instruments and extended techniques. Unfortunately, here Mochizuki’s penchant for the reiterative moved past the merely confrontational to the assaultive, populating the work with fortissimo thwacks of a tam-tam over and over again and a flock of searing bowed crotales (which appeared elsewhere on the program in a similarly overdosed measure). JACK gave an excellent performance of Mochizuki’s first string quartet Terres Rouges (2006). Once again, there was a “kitchen sink” aspect to the catalogue of playing techniques featured; in general, editing could be a friend to the composer. However, several of the gestures found a structural place that helped one sieve through the panoply: a strident high violin note that opened the piece and reappeared, transformed, at its conclusion, the exertion of varying degrees of bow pressure, microtonal harmonics, and hammer on techniques reminiscent of the way heavy metal guitarists dig in. Indeed, one could see the members of JACK revelling in the challenges posed to them, acting as a tight ensemble unit. The concert closed with Le monde des rond et de carrés (2015). Written for Yarn/Wire and first premiered at the 2015 Lincoln Center Festival, it is a piece just as much about ritual and choreography as it is about challenging chamber music. Its beginning is particularly striking. Percussionists Ian Antonio and Greenberg made their way from the back of the hall to the stage, playing crotales and cup bells. 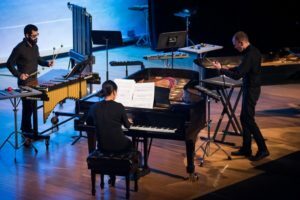 Once onstage, they were joined by pianists Laura Barger and Ning Yu in unison passages, which gradually began to accumulate a more extensive pitch profile as the percussionists moved to mallet instruments. The intensity of the glockenspiel and vibraphone, played in fiercely fortissimo patterns, urged the pianists to their own glissandos and ostinatos. After the aforementioned searing passages featuring bowed crotales, a drumkit was added to the proceedings, first played by Antonio, then with Greenberg joining in. The piece’s climax involves the kit exclusively, with both the pianists joining the percussionists attacking the kit as well, unleashing a bombardment of crashing cymbals and forceful drumming. It was a kinetic and fascinatingly choreographic conclusion to the piece and the concert. Mochizuki has found stalwart advocates in Yarn/Wire and JACK; one can imagine future fruitful collaborations among them. This week in New York, Austrian Cultural Forum celebrates the music of Georg Friedrich Haas. Haas, currently MacDowell Professor of Music at Columbia, is a thoughtful and innovative composer. The two programs curated by ACFNY, both free (with reservations), are excellent opportunities to hear two different facets of his creativity. On Wednesday February 24th at 7:30 PM at the ACF, JACK Quartet performs String Quartet No. 3 In iij. Noct., a piece that occurs in total darkness. On February 26 at 8 PM at Bohemian National Hall (321 East 73rd Street), the Talea Ensemble presents the following program of large ensemble and chamber works: La profondeur (2009), for lower instruments, I can’t breathe (2015), a US Premiere that commemorates Eric Garner, played by trumpeter Gareth Flowers, tria ex uno (2001), and …wie stille brannte das Licht (2009), featuring vocal soloist Tony Arnold. James Baker conducts.